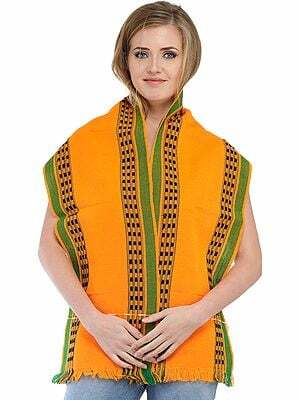 Nagaland, a turbulent tribal land waking up from its dreamy isolation into the din and clatter of the twentieth century. 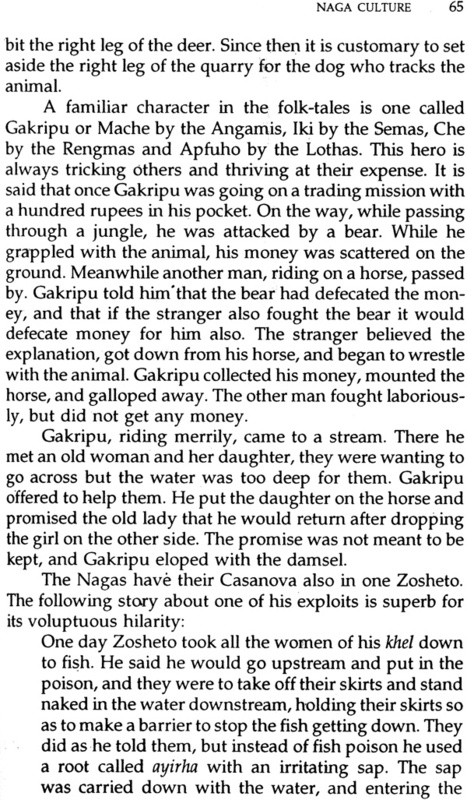 Here the tensions and passions of a tribal society mingle with the mainstream of Indian nationalism. The book presents a multi-dimensional picture of the land, its people and their aspirations. It throws new light on crucial phases in the political evolution of the Nagas, and exposes the sinister role of foreign powers in setting the peaceful Hills aflame with insurgency. Prakash Singh, a member of the Indian Police Service, served in Nagaland from 1965 to 1968. This gave him the opportunity to study the Naga way of life and understand the political currents and cross-currents of the area. 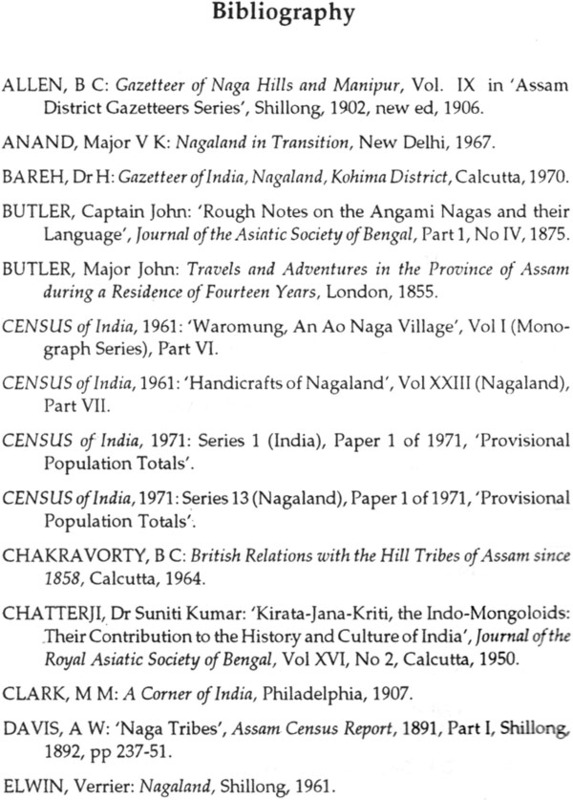 He was also Director-General of Police, Assam in 1991. The other top assignments he held were as Chief of Uttar Pradesh Police and Director-General of the Border Security Force. A very distinguished officer, he was awarded the 'Padmashri' by the Government of India for his outstanding contribution to national security. 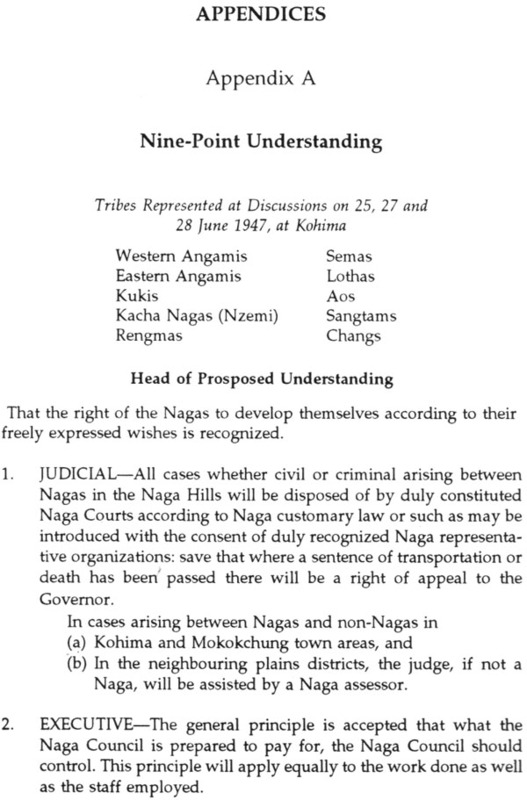 Nagaland was virtually a terra incognita until the early nine- teenth century. 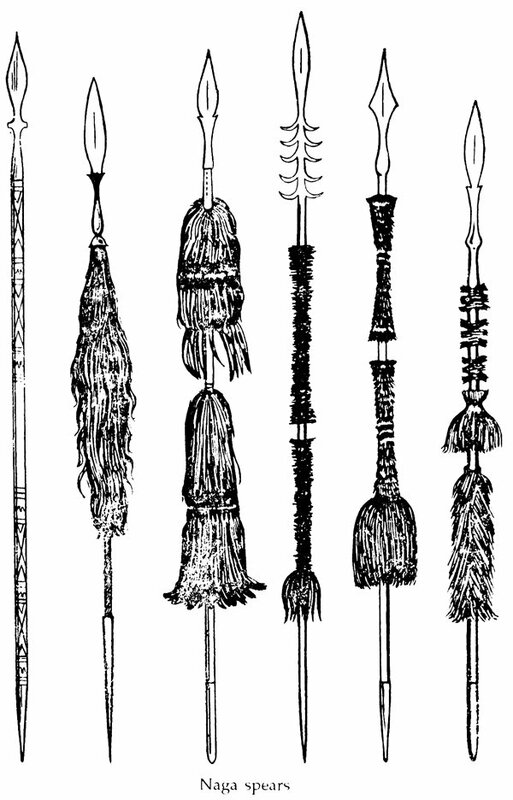 Very little was known about the country or its people except that the area was inhabited by savage tribesmen who practised the cult of head-hunting. 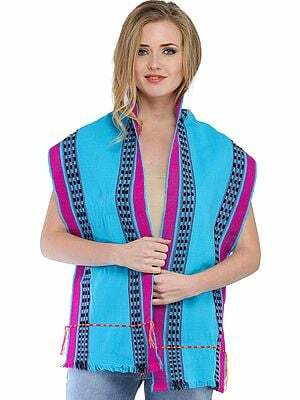 A tre- mendous transformation, however, has taken place during the last about one hundred and fifty years. From primitive conditions of existence, the Nagas have suddenly been cat- apulted into the modem scientific age. The isolation of centuries has been broken and the community is no longer, to borrow Toynbee's words, "lying torpid upon a ledge on a mountain-side with a precipice below and a precipice above." The Naga tribes today, unlike Brazil's Cinta Largas or Philippines' Tasadays, are throbbing with a new life-they are seeing new horizons. Such sudden transformation, however, invariably pro- duces an evolutionary crisis. The political turmoil, social malaise, and the cultural hotch-potch that we witness in agaland today are all symptoms of that crisis. The Under- ground Nagas' demand for independence is pitted against the majority's desire for peace. The social ethic of the past is getting eroded under the impact of Western ideas. The destruction of the old values, while a new philosophy of life is still in the process of crystallization, has created a cultural void. Political stability, social harmony and cultural balance are only a question of time. Given goodwill and under- standing, the change-over should be smooth and quicker too. Nagaland has a geo-political importance of its own. With China in the north, Burma in the east, and Bangladesh close to its western borders, the State is susceptible to the developments in the region. The interference by foreign powers, Pakistan and China, in its affairs-their aid to and abetment of the Naga Underground-contributed to an insurgent situation developing in the Hills. It is of the utmost importance, therefore, that everything possible is done to eliminate those factors which bred fissiparous ten- dencies in the past and to bring the Nagas into the national mainstream. The British established an administrative ap- paratus and maintained law and order in the Hills-and this was no small an achievement-but they insulated the area and kept it more or less as a pocket of exotic tribal culture. 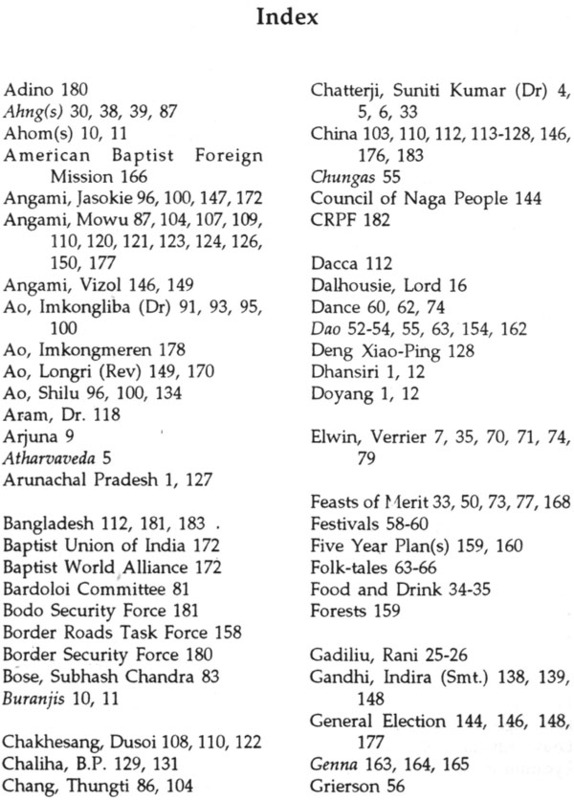 The only concessions they made were in favour of the Christian missionaries. The administrative and political seclusion of the Naga Hills naturally resulted in a feeling of separatism, and it erupted in the form of a rebellion by a section of the Nagas in the mid-fifties. The restoration of the historical imbalance called for sacrifice; let us hope that the price has been paid by now. 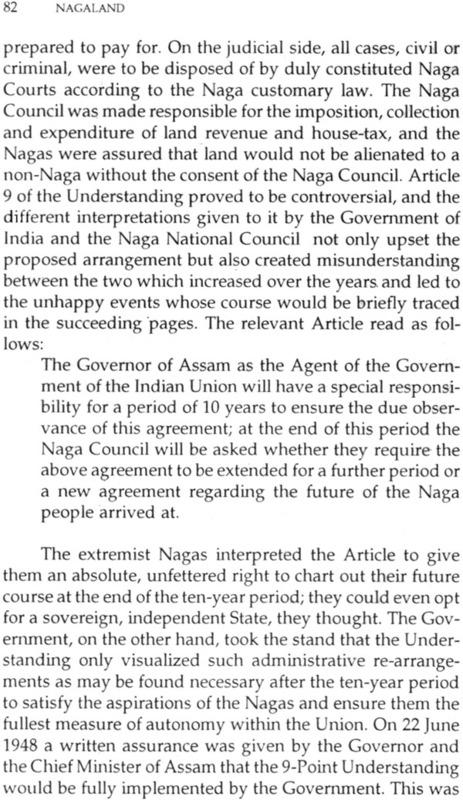 Nagaland has provided the pattern for the tribal move- ment in the north-eastern region. It was to satisfy the political aspirations of the diverse ethnic and linguistic mi- norities in the region that the entire area was reorganized. 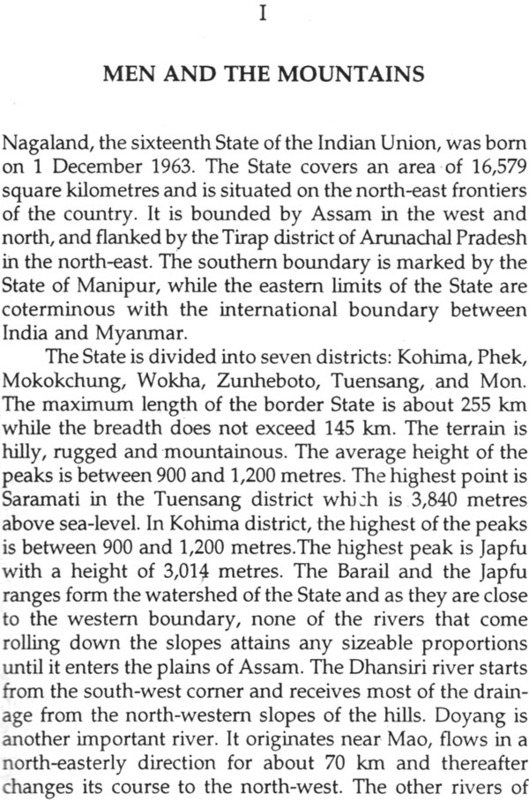 The north-eastern region now comprises seven distinct units: the states of Assam, Nagaland, Meghalaya, Manipur and Tripura, and the Union Territories of Arunachal Pradesh and Mizoram. 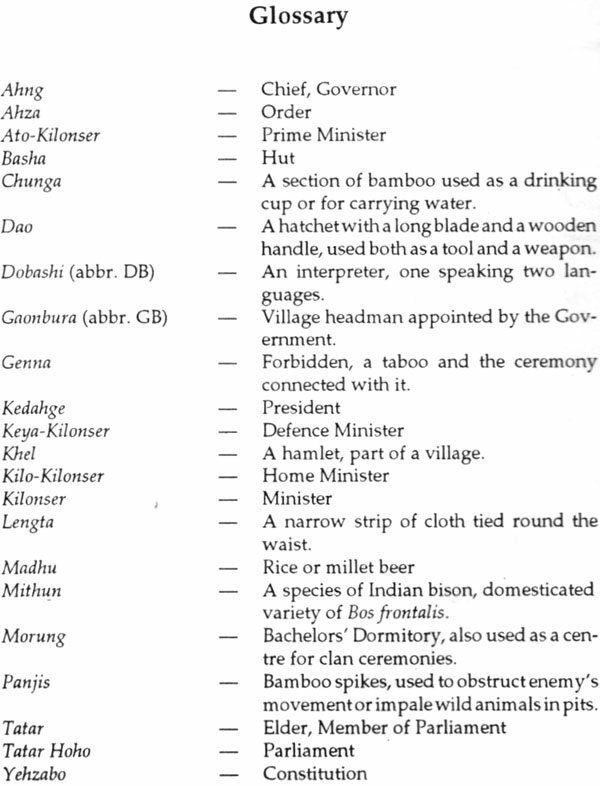 The grant of statehood to Nagaland in 1963 was, in fact, the starting point of these historical develop- ments. 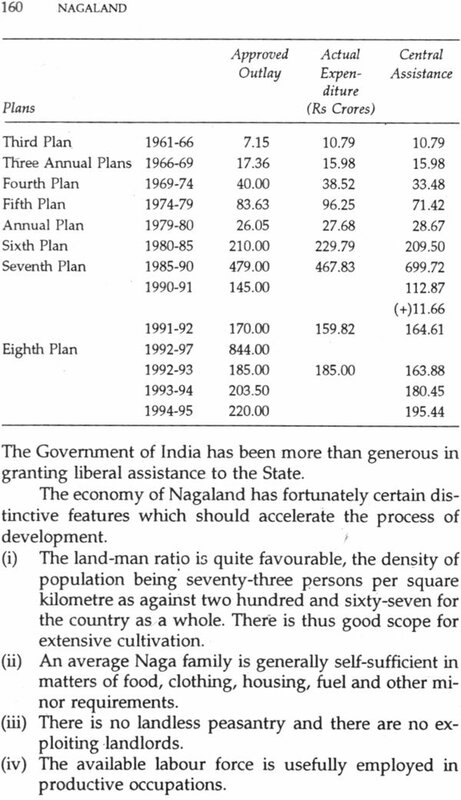 Hence arises the need to understand the develop- ments in Nagaland, particularly those of the post-Indepen- dence period. 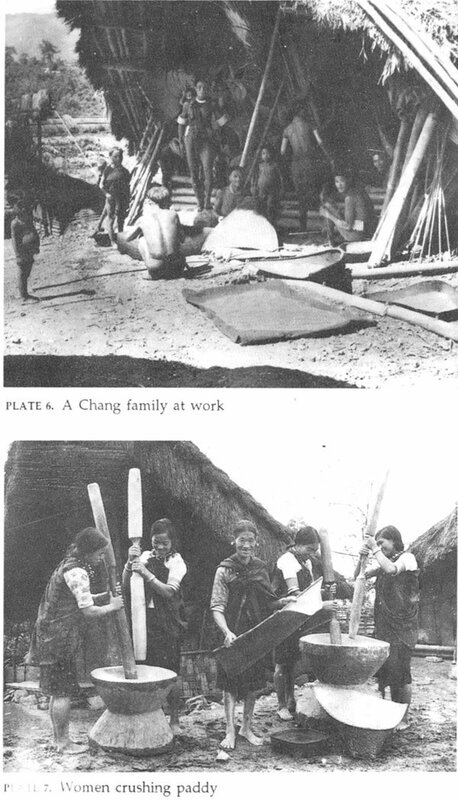 An attempt has been made in these pages to present a picture' of these developments from different angles. The task attempted has been multi-dimensional and for that reason, apart from my own limitations, it must have its shortcomings. However, if the book is able to inform the curious and stimulate intelligent inquiry and specialized research, for which there is vast scope, I would consider my labours rewarded. Any opinions expressed in the book are my own and do not in any way reflect Government's thinking or policy in the matter. I would like to record here my gratitude to all those who helped me in the preparation of this book. I am indebt- ed to my colleagues Shri V K Kaul and Shri J N Roy for their valuable comments on the text. Shri J B Murty and Shri C N Shukla were very helpful to me in collecting the mate- rial. Shri Moasosang Ao enlightened me on the spread of Christianity in the area. Shri Girdhar Mathur and his assis- tant Shri Subrata Basu deserve all the credit for the line- drawings. There are many others who helped me from time to time in various ways; to all of them I am obliged. I am particularly grateful to the Directorate of Infor- mation and Publicity, Government of Nagaland, and the Photo Division of the Ministry of Information and Broad- casting, Government of India for permitting me to reprint some of their photographs. Rupa Publications India Pvt. Ltd.